I was about to start my own blog on the three african popes, because of all the attention being given to Cardinals Turkson, of Ghana, and Arinze, of Nigeria. But then, i found this blog, and decided it was even better, because it came with a cool map showing the known or presumed birthplace for all known bishops of Rome outside of Europe. He even includes St. Peter. I am still going to work on a quick post about the geographic distribution of the college of cardinals, and how it might better represent global Catholicism. I decided to study and map out popes born outside of Europe. There were some surprises among the results. Of the 265 officially recognized Popes, 217 have been Italian while 17 were French and 13 were Greek (though this includes ethnic and cultural Greeks who were from Greek Italy and Greek Asia). So to solve problems like this I declared a non-European pope to be one who was born outside the modern understanding of what is Europe, regardless of ethnicity or culture. Three Popes were born in Roman Africa, which today is part of Algeria, Tunisia, and Libya. These African popes were Pope Victor I (189-199), Pope Miltiades (311 to 314), and Pope Gelasius I (492 to 496). These Popes are sometimes described as Black in today’s press because of their African origin. However, the elite in these provinces were descendants of Italian Romans while the population in rural areas were Berbers, who are an olive hue. There is no comparably or historic evidence that the African popes were Black. Two popes, both ethnically Greek, were born in modern day Turkey. Pope John V (685-686) was from Antioch and Pope John VI was from Ephesus (701-705). John V is sometimes considered “Syrian” due to Antioch’s location in Byzantine Syria. Four popes were born in “Syria”, modern-day Syria and maybe Lebanon. These are Popes Anicetus (150 to 167), Sisinnius (708), Constantine (708-715), and Gregory III (731-741). Anicetus was born in modern day Homs, site of heavy fighting in the on-going civil war, while the other three were born in newly Muslim conquered Syria. This shows that Christian intellectual thought and leadership were not crushed right away by the new Muslim rulers. Two popes were born in modern day Israel, depending on who one asks. Saint Peter, the first Pope, was born in the village of Bethsaida along the Sea of Galilee while Pope Theodore I (642-649) was an ethnic Greek from Jerusalem. However, Bethsaida is east of the Jordan River in the Golan Heights region. This is Israel or Syria on depending one’s perspective. Meanwhile, the historic part of Jerusalem where Pope Theodore I was from is mostly likely in the part of the city east of the 1949 cease fire line and therefore either Israel or the West Bank. So of the eleven popes born outside Europe, at least two were of ethnically non-European origin: Peter (Jewish) and Constantine (Assyrian). Up to three more, the Africans, may have been Berber. So between 0.75% to 1.88% of all Popes were of non-European ethnicity. Some of these Popes played major roles while pontiff. Pope Theodore I worked hard and proved Roman supremacy over the Emperor and Patriarch in Constantinople. Meanwhile Pope Victor I was the pope who changed the language of the Roman Church from Greek to Latin. Without his change traditionalist Catholics would be lamenting the loss of Greek in today’s liturgies. Soon the Vatican will announce there is a new Pope. No one yet knows who that person will be and where they will be from. However, now you have a better understanding of the history of non-European popes. Original post from Geographic Travels. Today’s press conference focused on Pope Benedict’s schedule for the rest of the month, and some of the same questions i addressed earlier today. The conference can be viewed on Vatican Radio. Official summary here in English. Below is a summary of my live tweets at @fatherroderick during the press conference by Fr. Lombardi at the Vatican earlier today. Right now, the Pope is working on the things he has to do in the next weeks, like his general audience tomorrow. Until Feb 28, the Pope continues all his work. Ash Wednesday celebration will be at Saint Peter’s Basilica instead of on the Aventine. The reason for this is because of the large crowd expected to show up. The last general audience of Pope Benedict XVI will be at February 27 on Saint Peter’s Square because of the large crowd expected to show up. There will probably not be a specific ‘event’ to say goodbye to pope Benedict XVI, he will use the planned events instead. The pontificate of the Pope ends Feb 28 at 8 pm, because that is normally the hour on which the Pope concludes his working days. The decision of the Pope has a message for us all: one of humility, courage, wisdom to acknowledge his limitations. The Pope is someone of great realism. Knows the problems of the situation of the Church in today’s world. Has a broad view. There are no specific illnesses that lead to the Pope’s resignation. Fr. Lombardi says the Pope has had a pacemaker for 10 years. Routine maintenance 3 months ago as reported by newspapers. The trip to Mexico and Cuba was part of the process that led to the Pope’s decision to step back. World Youth Day is in its essence a meeting of the youth with the Pope. So it is very, very likely the new pope will be there. Of course, the new pope can decide what he wants, but it is normal to assume that Benedict XVI’s successor will go to Rio. After his retirement, pope Benedict XVI will have no tasks or responsibilities in the Vatican, it’s possible that in the future, he will choose another place to stay, but for the time being, he will live in the Vatican at the monastery of Mater Ecclesiae. The Pope’s planned encyclical letter on Faith won’t be released before Feb. 28, instead it will be released later as reflections. Pope Benedict XVI has often expressed his desire to pray and to write. We hope he might write something for us too. The monastery of Mater Ecclesiae is currently being renovated; the sisters will move out, no new sisters to replace them. The Pope himself made the decision to continue to live at the Vatican. The Pope always walks around in the Vatican to pray the rosary, so he knows the monastery well, and knows what is possible. Fr. Lombardi says he doesn’t know yet how we will have to call pope Benedict XVI after he steps down. A Journalist uses “Papa Emeritus”, “Pope Emeritus” to indicate the Pope after he steps down. Fr. Lombardi says that the Pope will enter history as pope Benedict XVI, but we await instructions about his title after his resignation. Pope Benedict XVI will certainly remain bishop emeritus of Rome, but we’ll have to see if that is the title he prefers to use. The decision to announce the resignation was the Pope’s own, but of course there has been consultation about the calendar. The conclave must begin at least 15 and no later than 20 days after the resignation of pope Benedict XVI and Sede Vacante. On March 1, we have the situation of Sede Vacante. before the Conclave. Date of the Conclave depends on the Apostolic Constitution. Cardinal Marini is studying this. This is a new situation, so we will have to see what to do with rituals like the destruction of the Pope’s fisherman’s ring. Pope Benedict XVI will not intervene in the process of the election of the new pope. The cardinals will be autonomous. The Pope is not a cardinal. He will not participate in the Conclave. It’s up to pope Benedict and the new pope to decide if he will participate during installation Mass of new pope. The fact that Benedict XVI will continue to live in the Vatican will be no obstacle whatsoever for his successor, on the contrary. It will be a great support for the new Pope to have someone around who understands like no other what it means to be Pope. His successor will probably feel supported by the prayer of pope Benedict XVI after he resigns. The Pope doesn’t gather the cardinals for the new conclave; they are smart enough to know that they should be here in March. It’s not a problem if some cardinals arrive early in the Vatican to visit the pope. That’s the end of today’s press conference in the Vatican. Hope you enjoyed my live tweets. I apologize for possible translation errors. Franciscan blogger Daniel P. Horan adds some reflections on the level of ‘freedom’ involved in the previous papal resignations. Several question, some serious and some mere curiosities have arisen in recent discussions, both virtually and in person here in Rome: Does the pope abdicate, resign, or retire? How does this compare to Pope John Paul II? When will the conclave be? Which cardinals can participate? What will Benedict’s new title be? What is the protocol and prerogatives for a retired pope? What role does he have in the Vatican, the college of Cardinals, or the Church? Does he retain his infallibility? Does he still wear white? Official plans of the conclave will be publicized shortly, perhaps even today. It should not be difficult, even in the slow-moving Vatican, when many of the cardinals are already gathered for consistory. Though, at the same time, they may need a couple days to deal with the shock of the announcement. It seems only the dean of the college and a very small handful of others had notice even a day or two in advance of Monday’s announcement. The following includes official answers where available, and speculation or suggestions where indicated. CIC 332§2 Si contingat ut Romanus Pontifex muneri suo renuntiet, ad validitatem requiritur ut renuntiatio libere fiat et rite manifestetur, non vero ut a quopiam acceptetur. CIC 332§2 If it happens that the Roman Pontiff resigns his office, it is required for validity that the resignation is made freely and properly manifested but not that it is accepted by anyone. Though “abdication” is the term used when a monarch leaves, the term has not been used officially since the loss of the papal state, for the resignation of the popes. Though technically still an absolute monarch, as sovereign of the Vatican City-State, the pope is the bishop of Rome above all else, and therefore he “resigns.” Though, in this case, “retires” certainly seems a valid description. How does this compare to Pope John Paul II? We really should not compare the two. John Paul II showed us suffering and ageing in dignity, Benedict XVI teaches us genuine kenosis and leadership with integrity and humility. It is hard to continue a ministry that it seems the Holy Spirit has called you to when your body fails you, it is harder to let go of power so absolute. Voices that have criticized the Holy Father for resigning, saying things like “a father does not abandon his family,” or, “Wojtyla stayed until the end because one does not come down from the cross” seem to have missed the point. Being pope is not about suffering, but about serving. A bishop emeritus can give witness to dignified suffering and the value of the elderly, but an impeded pope cannot serve. Benedict has reminded us to separate the office from the person, putting the emphasis on the Petrine ministry, where it belongs. When will the conclave be held? …from the moment when the Apostolic See is lawfully vacant, the Cardinal electors who are present must wait fifteen full days for those who are absent; the College of Cardinals is also granted the faculty to defer, for serious reasons, the beginning of the election for a few days more. But when a maximum of twenty days have elapsed from the beginning of the vacancy of the See, all the Cardinal electors present are obliged to proceed to the election. This would seem to put the earliest starting date for the conclave on 15 March, and the latest starting date on 20 March. [This was confirmed by the Vatican Press office on 13 February]. Certainly, all hope that there will be a new bishop of Rome by Holy Week, which starts 24 March. One cardinal turns 80 on 26 February, and that is Lubomyr Husar, the retired Major Archbishop (de facto patriarch) of the Ukranian Catholic Church. According to the text, he would be excluded from the election, for being too old by less than 48 hours. Two others turn 80 in early March, Walter Kasper (March 5) and Severino Poletto (March 18), but even if the Conclave begins after their birthdays, they would still be admitted. What is the protocol and prerogatives for a retired pope? There is nothing in canon law or the apostolic constitution relating this. There are some ancient canons, and the precedent of retired bishops, that will be helpful. We know just a few things at this point, and the rest is speculation. We do know that Benedict XVI will not be involved in the election of his successor, and that he will retire first to Castel Gandolfo, and then to the monastery of cloistered nuns inside the Vatican for a time. What will Benedict’s new title be? The pope is the bishop of Rome. That is his title, his office, and the font of all other titles and offices, from Vicar of Christ to Servant of the Servants of God. Therefore the obvious choice would seem to be “bishop emeritus of Rome” just as any other retired bishop. But that is simply this ecclesiologist’s suggestion. What role will he have in the Vatican, the college of Cardinals, or the Church? Effectively none. In terms of protocol and precedence, one can imagine that he will be “ranked” below only the serving pope. Traditionally, popes have been forbidden from participating in the selection of their successors, and we already know he will be excluded from the coming conclave. When a powerful leader resigns, it always seems the best practice that he or she basically disappear from the public eye for about a year, at least, to allow his or her successor to settle into the role. When the last Jesuit general retired – another office that was until recently ‘for life’ – he became a librarian in the Holy Land, and kept out of even provincial politics. When Fr. Ted Hesburgh retired as president of Notre Dame after 35 years, he took a year-long road trip and tour, staying away from campus. Mary McAleese, after 14 years as president of Ireland came to Rome and moved into the Lay Centre at Foyer Unitas to return to her studies of canon law. Does he retain his infallibility? The pope is not infallible. Not personally, anyway: Infallibility is not a possession or power of the pope, but a divine gift attributed to the Church as a whole, and derivatively to the college of bishops as a whole. The bishop of Rome, in communion with and head of the college of bishops, may exercise that authority in some very limited, very precise conditions, but it goes with the office, not the individual. Will he still wear white? I have no idea; I would expect not, but it will be curious to see what is deemed appropriate. Perhaps a black cassock or simar with white trim? Several others are not entirely clear whether it was resignation or deposition, including at least Pope Marcellinus in 308 and Pope Liberius in 366. Plus there were others who are now considered antipopes who resigned, but at the time may not have been so clear who was the legitimate bishop of Rome. Some popes were deposed, others excommunicated. What I remember from history courses was that about 10% did not serve until death (and not all who did died of natural causes). John Paul II said in 1979 that he was open to the same idea, and it is said that he had a conditional document prepared as early as 1989, and again in 2000. Back in 2000, ecclesiologist Fr. Richard McBrien penned an article for the Tablet, asking the question of resignation with respect to the pontificate of John Paul II. His book, Lives of the Popes: The Pontiffs from St. Peter to Benedict XVI, is one of a handful of good, contemporary resources on the topic. We need to think more broadly than the bishop of Rome. We have seen other patriarchs and heads of churches resign, both within the Catholic Church, and in broader Christendom. All of them in positions that, in virtually all cases, were also considered normally held until death. The Catholic Coptic Patriarch Antonios I Naguib resigned in January 2013, at age 77. The Catholic Chaldean Patriarch Emmanuel III Delly resigned in December 2012, at age 85. The Catholic Maronite Patrairch Nasrallah P. Sfeir resigned in March 2011, at age 90. Archbishop Rowan Williams of Canterbury resigned, effective December 2012, at age 62. Metropolitan Jonah of the Orthodox Church in America resigned in July 2012, at age 53. So, while it has been almost 600 years since the last bishop of Rome willingly retired, we can and will get used to the idea. It takes remarkable integrity to lead by such strong example. 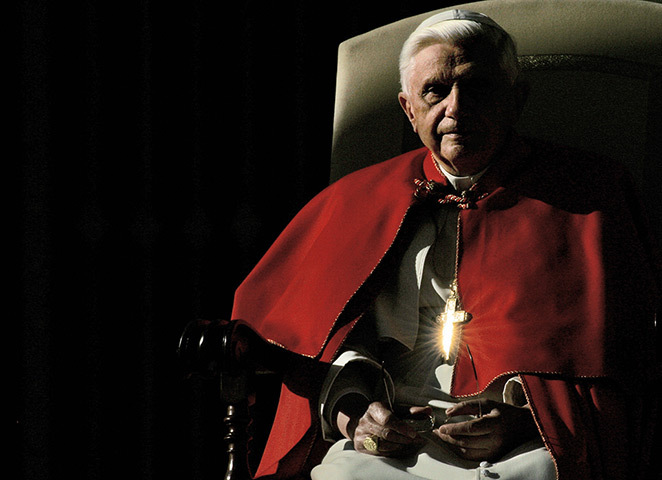 Pope Benedict XVI has given his resignation freely, in accordance with Canon 332 §2 of the Code of Canon Law. Pope Benedict XVI will not take part in the Conclave for the election of his successor. Pope Benedict XVI will move to the Papal residence in Castel Gandolfo when his resignation shall become effective.